Often, for shame, I leave fruit in a bowl on the counter to the point of moldy rot or rock hard, impenetrable skin. I try, I really do, and have the best of intentions, but have yet to master the skill of peeling a cutie every night for dessert or just picking up an apple and eating it the way apples are meant to be eaten. This seems to be the case for almost any fruit. Take grapefruit. Despite the fact that I consider the grapefruit to be a smell so perfect I insisted on having one in the hospital when I went into labor…just to smell…I almost always fail to actually eat them. And so I was determined today when I made note of a grapefruit beginning to dry out just a bit. I picked up some ricotta at the store (possibly because a recent ricotta gnudi recipe was also on my mind) and came home to assemble what I had forgotten to be a surprisingly satisfying and delicious breakfast. I toasted some sliced almonds and plain coconut while I prepped the grapefruit, slicing away the peel and freeing the supremes (always such a cute word) into a bowl. I then squeezed the juice from the remaining membranes (the opposite of a cute word) into a bowl and mixed it with some ricotta, honey and salt. 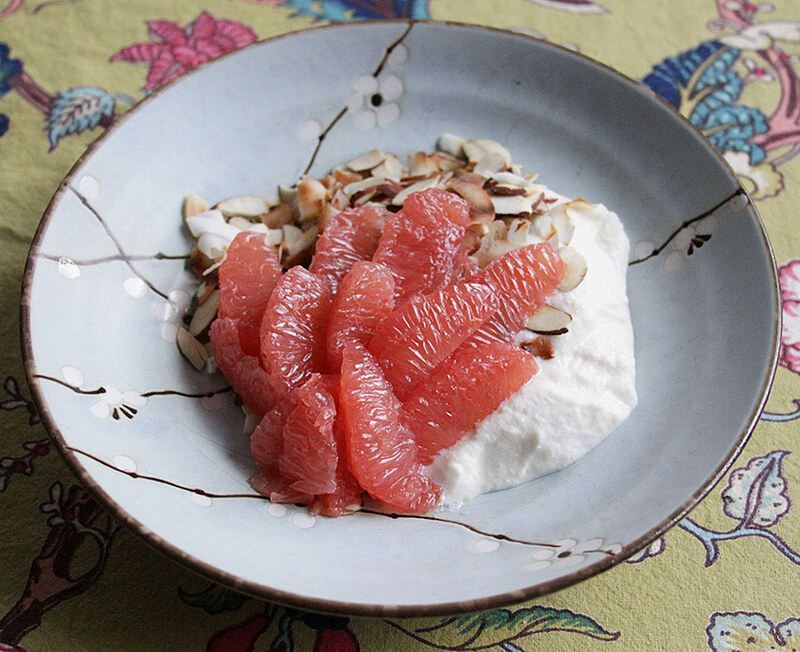 I put the ricotta mixture into a bowl and topped it with the nuts and coconut (the best part because they sizzle a bit) and layered the grapefruit on top. This dish is also amazing with oranges or you can use a bit of orange juice in the ricotta and top the pile with strawberries and banana. Mint would be nice but it is winter and I miraculously killed mine. So no mint for me. This entry was posted in Breakfast, Soulful & Simple by Marina Chotzinoff. Bookmark the permalink.